LiveU LU200 cellular bonding video transmission. 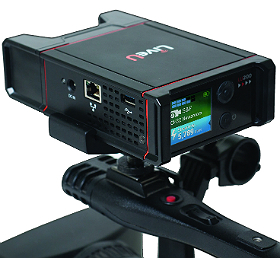 IBC Amsterdam, September 2014 – LiveU (www.liveu.tv), the leader in portable live video acquisition, contribution and management solutions, is unveiling its new ultra-small cellular bonding solution for global newsgathering compatible with any camera at IBC2014. The LU200 offers a very attractive price, performance and form-factor for live video transmission, expanding LiveU’s product portfolio for the broadcast market. The LU200 opens new live coverage opportunities, enabling every field camera to be equipped with a bonding uplink unit. Weighing just over 500 grams, (1 lb), the LU200 is available in a pouch or camera-mount configuration, bringing two built-in modems with integrated powerful antennas in a bonded solution for any video professional. The flexible LU200 can also serve as a stand-alone video encoder with satellite integration functionality, or be used as a LiveU DataBridge mobile hotspot for all IP applications in the field. “As we saw during the World Cup, where hundreds of LiveU devices were in action, cellular bonding is now firmly established in the mainstream broadcasting workflow”, Wasserman continued. The LU200 supports two 4G LTE/3G modems together with Wi-FI and LAN connections and includes LiveU’s proprietary antenna modules for extra resiliency. The LU200 will be demonstrated at IBC2014 and become commercially available after the show. The LU200 is the latest offering within LiveU’s multi-layered live video ecosystem and can be locally or remotely managed via LiveU Central, the unified management system for LiveU’s field-units. As the hub for video ingestion, LiveU Central allows broadcasters to acquire both live and recorded content from the field, preview it centrally or remotely, broadcast it live or in scheduled programming and distribute it to any location. LiveU will be exhibiting at IBC on Stand 3.B62. The company is hosting a press event on the stand on Saturday 13th September from 5:00pm to 5:30pm, which will see the unveiling of further LiveU innovations.